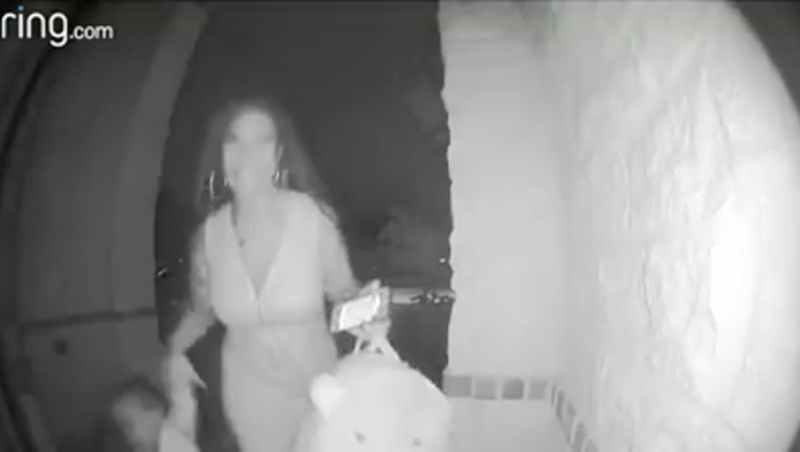 A woman who abandoned a 2-year-old child on a stranger's porch in Spring, Texas, last week is explaining why she left her friend's child unattended. Keairra Woods is blaming the child's mother for leading her to the wrong home, where she was caught on a surveillance camera dropping the toddler off, then quickly running away. Video of Woods leaving the child went viral last week and many people believed she was the 2-year-old's mother. The next day, authorities clarified that she was a friend of the mother's. The Montgomery County Sheriff's Department said Woods was supposed to be dropping the child off at his father's house next door as a favor for the mother. She went to the wrong house, and because she left the toddler unattended, she faces a charge of child abandonment. Woods told KTRK there is an explanation for her actions. "I followed the GPS. Mind you, I'm still on the phone with her [the child's mother], so by the time I get to the house, I say, 'Well I just pulled up to the house.' She said, 'OK, get out the car, get his bag and go to the door,'" Woods told the station. Woods said she described the house to the mother on the phone, who did not tell her it was the wrong one. "By the time I get to the door, I ring the doorbell. I still have him in my hand. I say 'It's like five cars out here, a red car, a black car, and a white car, and it's like two rows of cars.' She said 'OK,'" Woods told KTRK. "That should have let you know I was at the wrong house then, because you know your baby daddy don't drive so many cars," Woods said. "OK, so I ring the doorbell, the lady walks like halfway to the door. That's when I took off running." Woods said there were two reasons she ran back to her car before someone answered the door, one being that she did not have a sweater on and she was cold. The other reason, she said, was to avoid the child's stepmother, who has a restraining order against the child's mom. She thought the stepmother was coming to answer the door, and she ran away to avoid an interaction with her. Woods told KTRK it was a misunderstanding, and claimed she would never leave a child alone at a stranger's home.